As you know, I am a tea fanatic. One of my favorite teas of all time is Pacific Breeze from Gong Fu in Des Moines. However, when I’m on the road, I can’t always wait for them to ship it to me. So, I had to find a stand in. 🙂 Enter Rishi Citron Oolong. It’s sooooo yummy. Organic yummy. Citrus yummy. It makes me want to get out of bed in the morning yummy. So what’s in it? 100% Organic Oolong Tealeaves, 100% Organic Jasmine Flowers, 100% Organic Lemon Myrtle and Natural Essential Orange Oil, 100% Organic Osthmanthus Flowers. Can it be any more delightful? Oh, and it’s fair trade! Here is their other blurb about it: Citron Oolong is an artisanal blend of high-grown oolong tea, rare blossoms and succulent citrus designed to refresh and rejuvenate. The choice of connoisseurs, oolong tea is known as well as its ability to reduce cholesterol and aid in weight loss. 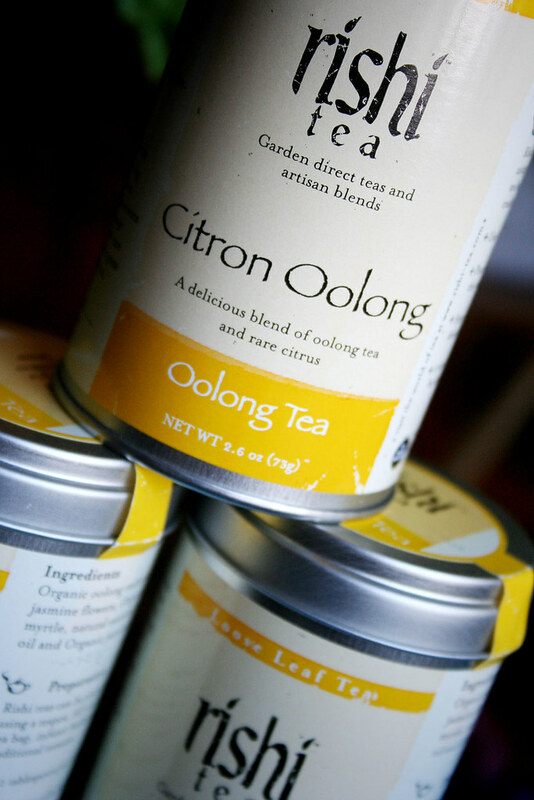 Oolong teas pair well with any cuisine and are typically enjoyed throughout the day. The refreshing flavor of green oolong with accents of lilac, orange blossom and rare citrus make a great hot or iced tea. Another reason to love oolong…you can brew it up to 4-5 times and still enjoy the flavors. You cannot do this with all teas. I usually brew a cup in the morning…and that first cup has the richest flavor. I leave the leaves in my strainer all day and just refill it at least 4 times. You won’t get at many citrus notes with the subsequent steepings, but the flavor change is really nice. ohhh I almost bought some tea like this during the holidays but I felt like I should not be buying a gift for myself so I put it back. I love tea too. Never drink coffee but always love some hot tea. I think I will make some now. That tea sounds yummy! I’ll have to try some. I love tea too!